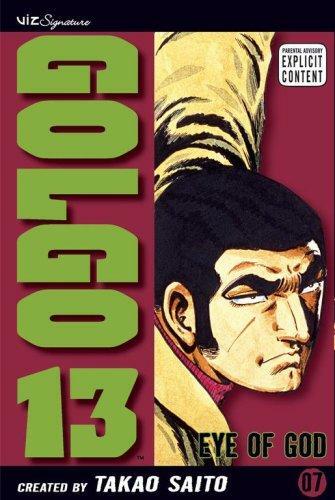 New copy of Golgo 13 Vol. 7: Eye of God Softcover from Viz Media. US$8.90 which includes shipping with USPS Media Mail within the continental United States. Orders placed before 4PM EST ship same-day. Published: February 20, 2007, Original Cover Price: $9.99 1st printing. GOLGO 13 7 A world class hit man, the ultimate Professional fulfills contracts under the alias of "GOLGO13." Without allegiance to any group, cause, or nation, he follows his own personal code when choosing "jobs." And once he accepts a contract, it is always honored. A true professional, GOLGO13 is an expert marksman familiar with most of the world's military hardware and master of several of the more lethal Oriental matial arts. Fluent in at least thirteen languages, GOLGO13 is able to slip in and out of even hostile nations without detection. Victims, they never know what hit them. Softcover, 170 pages, full color. Cover price $9.99. This item is brand new and sealed in plastic.